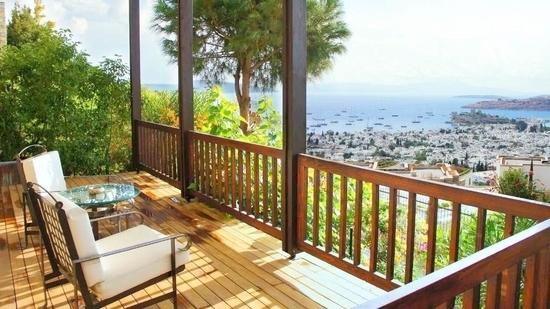 As a long established hub for tourism in Turkey, the Bodrum peninsula has dominated the luxury travel market. Offering elegant experiences through its prestigious hotels, bars and restaurants, it discretely serves some of the wealthiest people in Turkey and the world. Indeed famous celebrities such as Beyoncé, Renaldo, and Tom Hanks have indulged themselves at some of the finest establishments in the country. So which of the luxury hotels in Bodrum garner the crown as the favourite place to stay for the elite wealthy seeking exceptional hospitality? 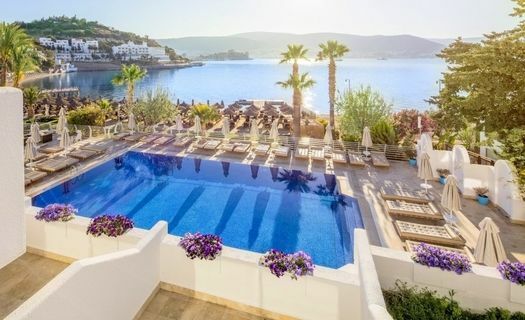 The international Kempinski chain of hotels has established itself as a luxury travel expert across the globe, therefore naturally lending weight to its presence in Bodrum. Overlooking the calm Aegean waters of Barbaros Bay, Kempinski Bodrum sells basic rooms from 190 euros a night, but their suite experiences promote a comfortable place to unwind and relax. Two hundred square metres on the top floor offer a full panoramic sea view, and small aesthetic details complete one of the best European luxury experiences. Working professionals utilise the business facilities on offer while couples often choose the luxury hotel as the venue for their weddings. Otherwise, the spa and wellness amenities including a Turkish hammam, and spa classics such as anti-cellulite massages, also offers wordly treatments such as Ayurveda, an ancient healing technique from India. Promising to be an ideal retreat where dreams come true, the Mandarin Oriental boasts about its five-star comforts stemming from a stylish environment offering serenity. Inviting their clients to lay back, relax and savour the moment, anyone booking in, can tap into a choice of 59 rooms, 50 suites and apartments, two private beaches, meeting and business facilities as well as luxury spa services. The Mandarin Oriental distinguishes itself from other hotels through its luxury apartments of which the four-bedroom duplex with private pool impresses everyone. They have also created an in-room menu combining the best of Turkish cuisine with Asian and international culinary favourites. As well as offering Dom Perion and the best wines, tasty dishes include eggs Benedict, a royal seafood platter, rib eye steak and international cheese hence anyone is forgiven for having gained pounds when they book out. This immaculate hotel offers five good reasons to stay with them including unrivalled luxury, top-notch spa treatments, excellent cuisine, 24-hour service, and a scenic yet peaceful environment. 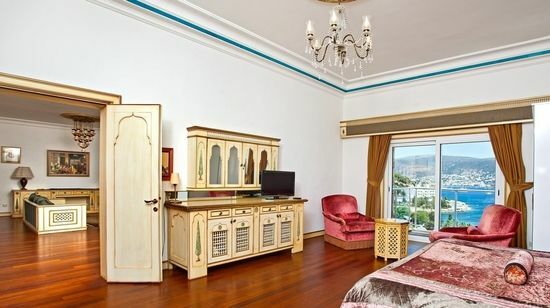 The gem, however, is the 1000 square metre Empire villa. Including the best of luxury living such as a private gym, sauna, hammam and spa centre as well as king size beds, and large TVs, delicious cuisine and unlimited refreshments are on tap 24 hours, and when customers are not indulging their taste buds, the pool, beach, and comfortable spa services make it easy to unwind. Their recommendation for relaxation is the Waldorf Astoria signature aroma and Astoria massages. Using the tagline of a “comfortable world of excellent services,” Rixos has made every effort to provide the best of luxury travel in Bodrum. The rooms with tasteful décor promoting a relaxing haven are impressive, but the villas are privileged living at its best. Covering 600 square metres and including a Finnish bath, private swimming pool, and spa, other small touches include a private butler and turn down service. Villa living aside, food fans can send their palette on a culinary adventure including Lebanese, Asian, and Turkish cuisine. Laying on a broad range of activities for kids from 17 months to 17 years, Rixos also excels in kids care and clubs. Their playful nursery and active fun schedule keeps them entertained while mum and dad enjoy tennis, Pilates, darts, and other easy-going sports. As another luxury hotel in Bodrum belonging to a countrywide chain, this beachfront haven is unique because it is only open to guests over 16. The no kids concept has mainly favoured admiration from business travellers, but the hotel also accommodates leisure travellers through its sports and spa centre. 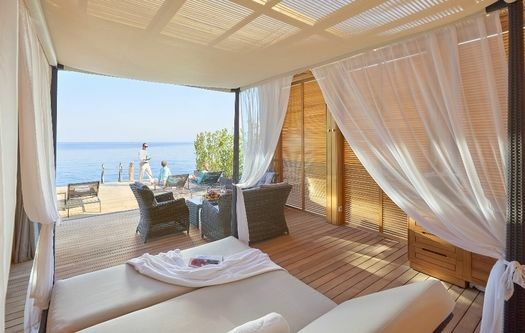 Numerous awards prove its ability to deliver on luxury relaxation in Aegean Turkey. Proving to be a favourite of wealthy Turks, it has also done well to market itself as a honeymoon destination for newlyweds. Marketing itself as an elegant establishment, room options at Caresse only start at deluxe, so there is no choice to downgrade if you are short on the cash. If money is no object, the 305 square metres Caresse villa will make you want to move in permanently. Their website promotes the private terrace with whirlpool as “The epitome of grandeur and the height of sophistication, this two-bedroom space exudes a level of opulence unlike anywhere. The villa provides ample areas for rest, including an expansive living and dining area and promises a truly unforgettable stay.” If you can bear to drag yourself away from the luxury villa, three onsite restaurants provide the best in fine dining, otherwise just order room service to continue your indulgence of the best in life. Citing their inspiration as the legend of the fairy that fell in love with Hermaphrodite, the Ottoman style theme of the Salmakis shines through in their junior and king suites, where traditional décor combined with modern trends provide luxury accommodation with a refined feel. The theme continues in their spa centre combining modern international treatments with the steaming and relaxing traditional benefits of a Turkish hammam. Despite their low-key appearance, Salmakis does well to accommodate all types of travellers including wedding and honeymoon couples as well as kids. Also operating on Park Avenue and Manhattan, the Marmara has excelled itself in its Bodrum residence. Each one of its suites has a separate theme offering guests the ultimate in luxurious choices. The wellness theme, also shines through in its state of the art gym with the latest cardiovascular and flexibility training equipment or intensely fit, or body conscious guests can employ the use of the hotel's personal trainer. Otherwise, the basketball, tennis, and squash courts will get the blood pumping, and the beach, spa and wellness centre deliver 100% on its promise of relaxation on another level. 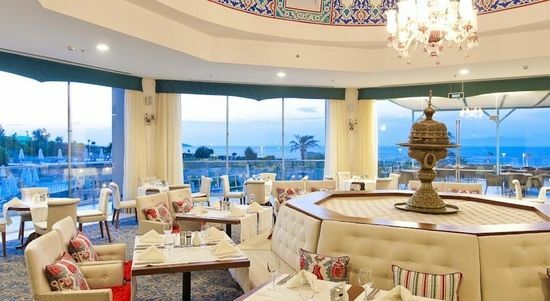 Lastly, no article about luxury hotels in Bodrum would be complete without mentioning a favourite hangout for millionaires that is the well-established Hilton brand. 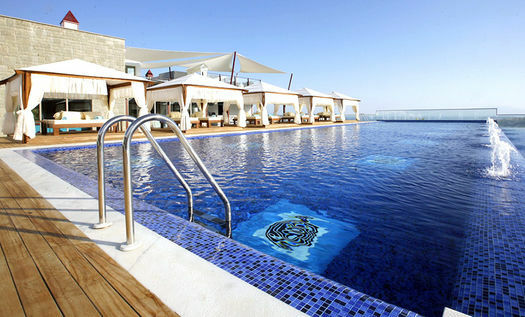 Sitting in the Turkbuku area of Bodrum, the Hilton has placed itself at the heart of a favoured celebrity hangout. 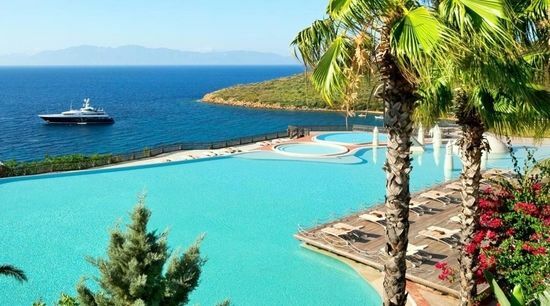 Offering all the standard amenities of its international brand, the presence of Hilton in Bodrum proves its established reputation as a leading provider of luxury travel in Turkey.